A United Auto Workers union hall for sale. Source: MPR News. Although I had begun the paper as a young, pro-union idealist researching the decline of unions and formulating strategies for their revival, by the time my paper was nearly complete, I had found that much of the ‘blame’ that union leaders placed on others for organized labor’s fall was misguided (at best) or, in certain cases, purposely misleading. By the time my paper was completed and my degree in labor-management relations secured, it was too late. My youthful pro-union idealism (ignorance, if you will) had been shattered and, over time, I decided to focus my career on working directly with ‘the enemy’ (management) to help resolve their labor issues without unions. It is with this as background that I’ve watched union leaders and their followers over these last 25 years flail about, trying ideas and schemes that, presumably, would help bring unions back from the brink of extinction, only to watch them fail miserably—and predictably. For example, how many remember today the 2005 break up of the AFL-CIO and how the (original) seven ‘Change to Win’ unions, with their “organizing is power” mantra, were going reshape, reorganize and revitalize the union movement? Within five years, the break-up’s main architect (SEIU’s Andy Stern) “retired,” three of the seven defector unions were looking at reunification and, by the break-up’s 10th anniversary, all but three of the seven defector unions had rejoined the AFL-CIO. In the end, the break-up of the AFL-CIO by the Change to Win “coalition” was an abysmal flop and a tremendous waste of resources (i.e., union members’ dues). Nearly 35 years ago, when I first became involved with organized labor during Ronald Reagan’s first term, unions represented 20 percent of the American workforce—down from its 1945 peak of 35.5 percent. In 1982, recognizing they were in trouble, the AFL-CIO Executive Council formed the Committee on the Evolution of Work. Apparently, those “strategic and tactical innovations” failed because, as of January 2018, unions now only represent 10.7 percent of the American workforce, and a mere 6.5 percent of the private sector. Even after having Barack Obama, a Democrat, in the White House for eight years, arguably the most pro-union President since FDR and after having planted union lawyers and staffers inside the National Labor Relations Board and other Department of Labor agencies, unions are still no better off than they were under Presidents Reagan, Bush I & II…or even Democrat Bill Clinton, for that matter. In fact, one could argue that unions are worse off after Obama’s tenure than they were before Obama was elected. During the time Obama was President, unions failed in almost everything they tried both through governmental paternalism, as well as on their own. Since 2009, when Obama took office, five more states have become so-called Right-to-Work states, after spending nearly $100 million to unionize fast-food workers not a single new SEIU bargaining unit has been formed in fast food and, even with the wind seemingly at their backs, unions failed to capitalize on the Obama-NLRB’s “ambush election rules” (which still exist for now) and the establishment of “micro-units” with more widespread union organizing. Further, since the National Labor Relations Board is now under Republican control, Obama-era rulings are beginning to get reversed and, worse yet, the Supreme Court’s recent Janus decision threatens to strip unions of the much-needed moneys to pour into their political machine on which they’ve become almost wholly reliant. Unions, with the exception of pinning their hopes on a political windfall in the 2018 mid-terms and 2020 presidential elections (which is all they seem to be doing now), are running out of directions which to turn. Frankly, if corporations were run like today’s unions have been run, its leaders solely dependent on government largesse as its marketshare continues to dwindle, shareholders would have demanded across-the-board CEO firings by now. As a result of the Court’s recent Janus ruling, many union pundits have been pondering what’s next for unions. Specifically, they wonder, how can unions be saved? To eliminate “Exclusive Representation” from the unions’ representation model. One of the “pro-union” ideas to help save unions that is emerging is the idea to eliminate the “Employment-At-Will doctrine” and make “Just Cause” the standard for all terminations for all workplaces in the U.S.
Union leaders, according to Fletcher, have rejected the idea with ‘narrowness,’ however, stating: If just cause provisions become law, why should workers join unions? If Fletcher was alone in thinking that eliminating employment-at-will would give unions a boost, it would be easy to dismiss the idea as just another one of the many ideas that have been thrown out there over the last several decades. However, in December, the New York Times published an op-ed calling for imposing a ‘just cause’ standard in all workplaces. Although the writers—a union organizer director and a pro-union lawyer—stop short of stating that eliminating just cause would help unions, it is implied. The employment-at-will doctrine, as we know it today, stems from old-English Common Law, and has evolved in the U.S. to essentially state that either party, the employer or the employee, can terminate the employment relationship, with or without notice, at any time or for any reason. However, it is important to note, the right to terminate the employment relationship is not a blank check. There are restrictions to employment-at-will and employers “need more of a reason than ‘I don’t like you’ to fire someone,” notes one Society of Human Resource Management article. Additionally, a number of states have substantially curtailed the employment at will. The Seven Principles (or Steps) of Just Cause Discipline are very simple and are often one of the first things unions train their ‘shop stewards’ on, as well as what good HR and labor relations leaders—union and non-union—train their supervisors on. In fact, in unionized settings, one of the main reasons employers lose arbitrations and are sometimes required to bring poor-performing employees back to work is because the employer has not followed the steps of Just Cause. While ‘Just Cause’ is not exclusive to unionized environments, it is one of several union organizing weapons that union organizers often sell to union-free workers as an enticement toward unionizing…and it is one of the few things that unions can pitch to say they could make a difference for non-union workers. For those of us in labor relations who prefer the ‘just cause’ standard as a pro-active employee relations policy, the implementation of this standard would not be catastrophic to most employers (as long as they are educated). However, even though unions are fired in unionized workplaces (for cause), making ‘just cause’ the standard in all workplaces would be catastrophic to unions as it would remove one of their last selling points. Unions and their allies constantly try to remind America’s union-free workers that unions brought about minimum wage law and overtime, the weekend, holidays, paid breaks, safe workplaces, etc. Yet, despite the unions’ constant reminder, appealing to workers’ nostalgia (e.g., efforts to make workers understand what unions have done in the past) has not moved the needle to increase union density. In sum, we live in a society that constantly asks why buy the cow when you can get the milk for free? Moreover, if union membership is voluntary (as it is now in 27 states and all of the public sector), one could easily see a significant percentage of union members who continue to pay unions dues as “insurance” against being fired “at will” dropping their union memberships if all workplaces are ‘just cause’ workplaces. In sum, most workers today don’t believe they need to pay a union for things that are codified into law today and eliminating “employment at will” in all workplaces will only lessen unions’ importance to non-union and unionized workers. Without a doubt, one of the biggest problems unions are facing today is the problem of being unable to require payment for their services in so-called Right-to-Work states and, now, the public sector. Under current labor law, once a union has been elected (or selected) to be the employees’ collective bargaining representative, the union becomes the “exclusive bargaining representative” for all of the employees in the bargaining unit (or the “craft and class” in the case of airlines and railroads)–regardless of membership status or individual employee desires. As a result of this dilemma, there are those on both sides of the labor-management divide who argue that, perhaps, it is time to end “exclusive representation” and turn to “members-only” bargaining. For employers, members-only bargaining has pluses and minuses. On the plus side, members-only bargaining can serve as a deterrent for more wide-spread unionization if the union is weak and does not produce results that are seen by non-union personnel as a positive. On the minus side, having members-only bargaining could open the employer up to having multiple unions under the same roof, which could be an expensive administrative nightmare and with the possibility of having multiple contracts, as well, it could produce the potential for multiple work stoppages at different times. For unions, members-only bargaining has one plus, and more downside risks. On the downside, were unions to go a members-only form of unionism, unions would a high risk of becoming even more ineffective and irrelevant, as well as risk being raided by other another union, or even decertified. Here’s how: There is nothing in the law (nor will there ever likely be) that says an employer cannot give its non-union employees more than its unionized personnel. In fact, it often happens today. Even if the wage and benefits are the same, the non-union workers save the amount that would be spent on union dues, which means joining a union would equate to a pay cut. At a minimum, if non-union employees see that their increases are the same or greater than union personnel (and they do not pay union dues), not only are they less likely to unionize, but unionized personnel begin to see that unionization does not benefit them and are more inclined to decertify their union. In addition, and one that has not been considered, what happens in a mixed bargaining unit–with union and non-union personnel working side-by-side–if the union chooses to go out on strike? Most likely, the employer would not need an elaborate strike contingency plan, because already-qualified workers are already in the workplace doing the bargaining unit work…even before the union walks out the door. 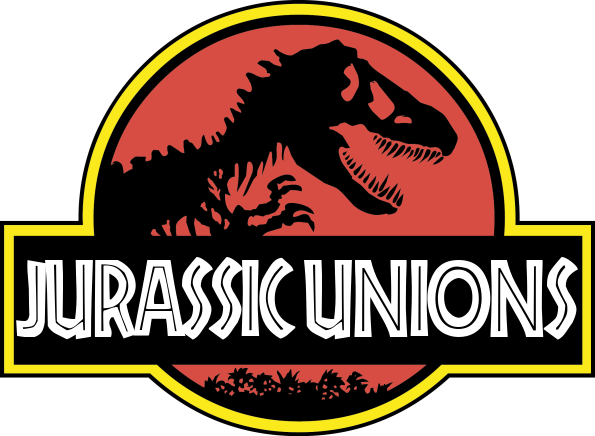 Now, imagine a world where all workplaces (union and non-union) have ‘just cause’ and an employers have union and non-union employees working within the same bargaining unit side-by-side, with the non-union group taking home more pay. If unions are struggling for relevancy now, it’s easy to see how the elimination of “employment at will” and “exclusive representation” will relegate them into extinction. Unions Claim Wages Are Lower In Right-To-Work States. But, Are They? Do You Let “Job Stoppers” Stop You From Hiring Qualified People?